If you’re considering back surgery, you should know that while minimally invasive surgery using a laser is effective for some conditions, it isn’t a miracle cure, and it isn’t for everyone. Find out what you need to know. Does the idea of stepping out of a surgery center pain-free, with only a small bandage on your back, sound appealing? It’s this image of a quick, easy cure that makes the idea of laser spine surgery so enticing to people with chronic back pain. But if you are considering back surgery, you should know that while minimally invasive surgery using a laser is effective for some conditions, it isn’t a miracle cure, and it isn’t for everyone. According to Thomas E. Mroz, MD, Director of Cleveland Clinic’s Center for Spine Health, “If you’re considering back surgery, it’s important to understand the differences between traditional, minimally invasive and laser spine surgery. You want to work closely with your physician to understand which option is best for you,” he says. How does laser surgery compare with other methods? Lasers can treat some patients, but only for certain conditions. 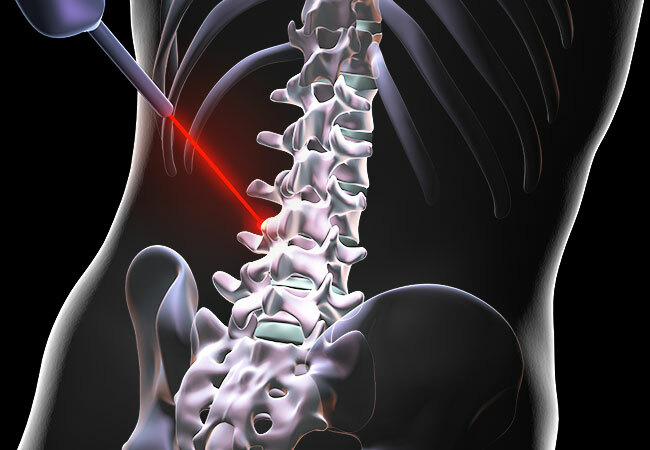 Experts rarely recommend using a laser for people with degenerative spine disease, for instance. Here’s how it stacks up against other methods. Traditional surgery. In the traditional “open” approach, the surgeon’s incision goes through the skin to the muscle. Then, the surgeon dissects the muscles away from the spine so that he or she has a clear pathway to work on the spine. While this has advantages for accessing problem areas, it also poses a risk of damaging the surrounding soft tissue, which can lead to longer hospital stays. Minimally invasive surgery. The surgeon makes a smaller incision than the one used for a traditional procedure. He or she uses a tool to tunnel to the site of the pain. Because the muscles aren’t elevated from the spine, there is less pain after surgery and the recovery time is often shorter, allowing people to return to their day-to-day activities more readily. Laser surgery. Surgeons use lasers to remove portions of soft tissue that can compress nerves, such as ligament enlargement or herniated discs. However, lasers are only appropriate for certain conditions. They can help surgeons remove either tumors from the spinal cord or bone and soft tissue from around a nerve. Lasers may also be best for shrinking disc material around a nerve. What are the potential complications of laser surgery? Inadequate operation: Perhaps the biggest problem with laser surgery is the risk of having an inadequate operation, which sometimes means you’ll need additional surgery, he says. If you have leg pain caused by a spinal deformity, minimally invasive or laser surgery may improve the leg pain briefly, but may not fully treat the root cause. Nerve damage: Using a laser during surgery can sometimes limit nerve damage. But in the hands of an inexperienced surgeon, a laser can actually increase the chances of tissue or nerve damage. To ensure that you are getting the best treatment for your condition, do your homework and prepare questions for your surgeon. Will a laser likely be used? Would a minimally invasive or traditional approach be better, and why? What will the surgery treat (back or leg pain, or both)? What are potential complications and complication rates? How experienced is the surgeon? Has the surgeon been trained formally (i.e. fellowship) in spine surgery and/or minimally invasive surgery? Does the surgeon do both traditional “open” procedures and minimally invasive surgery? This is ideal. What should you consider for the best results? The bottom line is that more complicated back problems often require traditional surgery for the best outcome. “There is no magic bullet or miracle for many spinal diseases, but technology and techniques have evolved greatly. Every patient and every spinal condition must be individually assessed so that we can deliver the most personalized, effective, and technologically advanced surgical treatment,” says Dr. Mroz. If you are considering surgery, he recommends choosing an experienced physician who is trained in both traditional and minimally invasive approaches.